Jean and Lili accomodate you in an old Ossaloise residence out of stones of the country, where are arranged at pleasant ground floors 3 and comfortable rooms of hosts. You will benefit from calms in the park flowered and shaded with the foot of the mountains of the valley of Ossau in Béarn in the Pyrénées-Atlantiques. 3 rooms (3 beds 2 sea-green.) arranged with the r-d-c. of a large Ossaloise house. 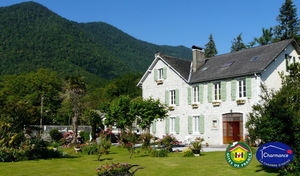 Lili and Jean reserve to you a family reception in this old residence of Master located in valley of Ossau. You will be able to slacken in the shade of the trees of the park. The housewife will level you copious breakfasts. Vehicles parked in the park. Presence of a small lodging. Excursions in mountain of the Valley of Ossau. GAN: Laruns direction - collar of Pourtalet- Aubisque.